Heineken is trying to catch the Asian tiger by the toe. The Dutch brewer launched a $6 billion bid to take control of Asia Pacific Breweries, its longtime Asian partner, pitting it against a thirsty Thai beer mogul and Japan’s Kirin. It’s a bold move for conservative Heineken that will put Singapore’s corporate governance bona fides to the test. Amsterdam-based Heineken is offering S$50 a share, or some $S5.3 billion including other interests the two hold, for the 40 percent of APB that is held by its joint venture partner since 1931, Fraser & Neave. Along with its current holding of 42 percent, that would give Heineken 82 percent of the company, triggering a mandatory S$2.4 billion offer for minority interests in APB under Singapore’s takeover code. If the bid is successful, Heineken will be paying a premium of about 43 percent to the undisturbed market price, worth some $1.8 billion, for the rest of APB. That’s a pricey ticket to keep the status quo in Asia, where volumes grew twice as fast as they did in the Americas in the first quarter of the year. To cover the premium, Heineken would need to extract synergies equal to about 50 percent more than APB’s current earnings before interest and tax of around $500 million. But getting to that point will be tricky. In the move that triggered Heineken’s offer, Thai beer mogul Charoen Sirivadhanabhakdi agreed to pay some $3 billion earlier this week to acquire a chunk of APB and Heineken’s partner, F&N. Kirin of Japan owns 15 percent of F&N, too. While they do not hold a majority in the conglomerate with interests in food, soft drinks and property, they could certainly influence the company to reject Heineken’s offer. In that sense, Heineken’s maneuver provides a compelling test of capitalism, Singapore-style. With competitive offers for a beer business that F&N does not, in the end, control, the company’s independent directors should be working to extract the best deal for all shareholders – not just its new Japanese and Thai constituents. 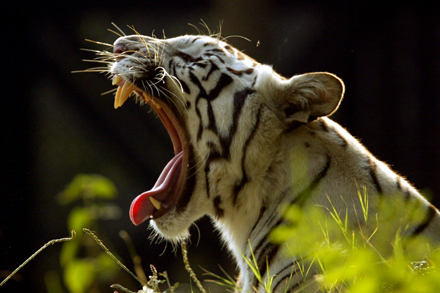 A white tiger yawns in New Delhi zoo. Heineken NV launched a counter-bid for Asia Pacific Breweries (APB) on July 20, trumping a surprise offer for the beer maker by a Thai billionaire and his family. The Dutch brewer sought to acquire Singapore-listed conglomerate Fraser and Neave’s direct and indirect stakes in APB, one of the biggest Asia-Pacific breweries, putting a S$50-per-share bid on the table. That tops the S$45-a-share offer proposed by companies linked to tycoon Charoen Sirivadhanabhakdi for part of those holdings. Fraser and Neave (F&N) owns 40 percent of APB. Heineken already owns 42 percent of the beer maker. Rival brewer Japan’s Kirin Holdings also owns a 14.7 percent stake in F&N.